Friday 13th April saw the ladies at The Kingfisher Care Home. We all arrived full of beans and ready to give our best performance of the year so far! 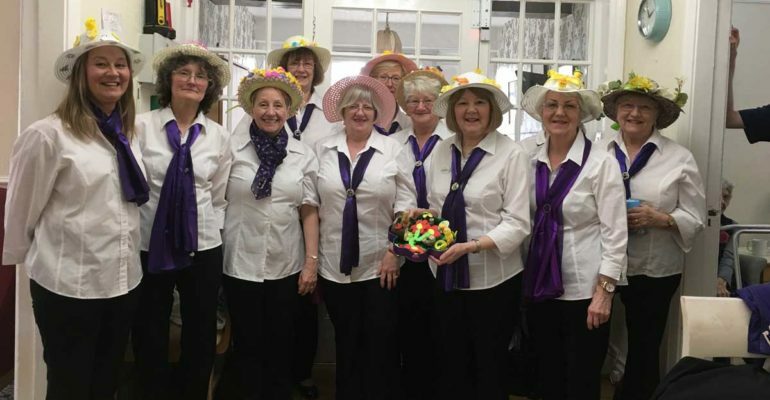 Everyone had their Easter bonnets and we had all been busy decorating them with various leaves, chicks and flowers. We sang our usual repertoire that The Kingfisher Care Home residents enjoy and some Soundwaves ladies introduced each song as we sang. The weather was quite pleasant but in recent days we had seen lots off rain. It was therefore apt to start our sing-along with April showers! We finished our penultimate sing along song with a tribute to the late sir ken Dodd with “Happiness”. Our last song was “With a little help from my friends”. All our ladies went away with a smile on there faces and a song in their hearts.